Kirsty was the daughter of Ewan MacColl, a British folk singer and composer whose 'First Time Ever I Saw Your Face' (always id in MacColl biographies) was made famous by Roberta Flack and has more recently been covered by Alison Moyet on her Singles collection and (ugh!) Celine Dion. Her mother, Jean, was a choreographer. She attended art college, and joined a band called the Drug Addix which never got further than supporting Graham Parker and the Rumour and recording an EP. She quit the band late in 1978 and gained a solo contract with Stiff which lasted intermittently until 1985. Instrumental in gaining her the contract was Liam Sternberg (who composed the Bangles 1985 hit 'Walk Like An Egyptian'), who also produced her first single, 1979's 'They Don't Know', including backing by a band known both as the Edge and the Belvederes. One of the members of this band was Mark E. Nevin, later to work with her as a co-songwriter and producer. Following this initial success, Kirsty kind of disappeared as a solo artist for the first half of the 1980s, apart from her classic single 'There's A Guy Works Down The Chip Shop Swears He's Elvis' from her debut album Desperate Character. She first hit the charts in a big way with her cover of Billy Bragg's 'A New England' in 1985, which led to a re-release of the debut album with a slightly altered tracklisting. Then there was virtual silence again until 1989's breakthrough Kite album. Since then, she has released the albums Electric Landlady, Titanic Days and Tropical Brainstorm, as well as the hits compilation Galore and the radio sessions album What Do Pretty Girls Do?, and has toured regularly. Chart history: 'A New England' made the UK Top Ten in 1985, 'Days' made the UK Top Twenty and charted for four weeks in 1989, Kite did similarly on the album chart. Galore and its associated singles made brief chart appearances in 1995. That's not exactly a record-breaking performance, but c ritically MacColl has been recognised as a stunning talent for most of her career. The mass public may not have totally embraced her, but the critics for once have got it right and applauded her unique melodic sense and brilliant, biting lyrics. Let's face it, you know you're doing well when your record company says nastier things about you than rock critics do. "There is more to young Kirsty than mere gimmickry and she should fulfil her undoubted potential" proclaim the sleeve notes to The Essential Collection in the manner of a school report. Other MacColl fans online have also praised her more eloquently than I could. Her rendition of 'Days' was used in a Sony Handycam commercial, but I don't know that I'd call that praise . . .
MacColl's songs have been covered occasionally by other artists (if not perhaps often enough). The most famous instance is of course 'They Don't Know', recorded by Tracey Ullman (pre-actress fame) in 1982 for a UK and US Top Ten hit (Kirsty sings backing vocals on the record). This was part of a continuing involvement in Ullman's career. In total, the 1992 Tracey Ullman compilation You Broke My Heart In 17 Places includes four Kirsty compositions: 'They Don't Know'; ''You Broke My Heart In 17 Places' (written by Kirsty, produced by Kirsty, Gavin Povey and D. Robinson); 'You Caught Me Out' (written by MacColl/Briquette/Crowe and originally intended as Kirsty's second single); and 'Terry' (written and produced by Kirsty & Gavin Povey, and using exactly the same backing track as her own version). Ullman continues to use 'They Don't Know' as theme music for her Tracey Takes On series, although I'm yet to see Kirsty's name in the credits. In between the multiple career peaks, MacColl co-wrote four songs for Shine, a 1984 solo album by Frida (the brunette from ABBA if you're in the shameful state of not knowing), which was produced by Steve Lillywhite. 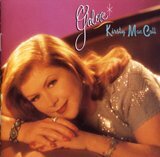 Three of these ('One Little Lie', written by MacColl and Simon Climie, 'The Face', written by MacColl and Daniel Balavoine and 'Chemistry Tonight', written by MacColl, Climie and Pete Glenister) are on the CD version of the album; the other ('That's Tough', written by MacColl, Frida herself and her son Hans Fredriksson) is only available on a rarities collection called The Voice Of ABBA which you can pick up in discount racks everywhere. Go get 'em. MacColl also does backing vocals on the Shine album. She also appeared as a backing vocalist for Talking Heads on their Naked album, and on two of Billy Bragg's, amongst many other BV performances (including Jona Lewie's 'In The Kitchen At Parties'. Random facts: She disapproved of men who do not dance in public. Surprisingly for someone addicted to "jangly guitars", her guitar playing skills were by her own admission rudimentary for some time. For a long period, she was nervous about performing live. She had two children, Jamie and Louis, by celebrity producer husband Steve Lillywhite (they can be heard shouting "Big money" on 'Innocence'). MacColl and Lillywhite separated in mid-1994. What had appeared one of the happiest periods in Kirsty's life -- she had found love with saxophonist James Knight, she was working on a new musical, 'In These Shoes' was a European hit and was covered by Bette Midler -- came to a tragic conclusion in December 2000, when she was killed in a motorboat accident whilst diving off Cuba. Words fail me . . . Since her untimely demise, there has been quite a bit of activity, including Karen O'Brien's biography The One And Only, the 3-CD anthology From Croydon To Cuba, a matching DVD collection and a best-of compilation which has become Kirsty's most successful album. Kirsty's mother Jean MacColl has also worked tirelessly to seek proper legal redress for Kirsty's death through the Justice For Kirsty campaign.